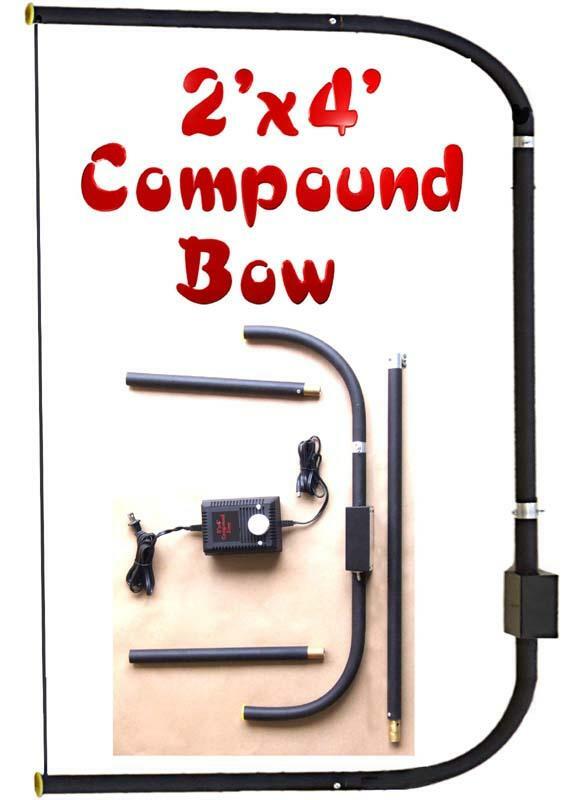 Compound Bow Cutter - Dino Rentos Studios, INC.
Our 2' x 4' Compound Bow Cutter is wider than 2' and 4'. This big versatile bow cutter will get those unwieldy 4' by 8' blocks or sheets of foam knocked down to manageable sizes. Built for pros, it's fast and agile and built to last. 1/3 the price of other whimpier bows cost, and ours is made in USA. Thick round tough rubber coated tubing makes a firm comfy grip. It’s two, three, four bows in one. Cuts fast, wide, deep or both: configure it at 2' or 4' long by 6" or 18" deep. Changes direction of cut instantly and cleanly. Use it in the 4' mode to make your big cuts, then quickly switch it to the 2' mode for creative sculpting. Convenient switch is right on the tool. Includes variable power and internally fused commercial power supply, and four 2'+ and four 4'+ long life Hot Wire blades. Plus, we give you 3 snap-clamps for storage, or so you can turn this into a workbench cutter to accurately slice foam. Quickly collapses for shipping and storage.